G20 leaders will meet in Hamburg, Germany, on 7 and 8 July 2017. The theme of the German presidency of the G20 is ‘Shaping an interconnected world’. The leaders will discuss the main topics of economic, financial, climate, trade, employment and development policy. Migration and refugee flows and counter-terrorism are other key issues of global significance that will appear on the summit agenda. On 29 June, German Chancellor Angela Merkel chaired a preparatory meeting with the European heads of state and government participating to the summit. Europe is taking more responsibility at the international level in these turbulent times. When talking about the biggest global challenges Europe becomes a reference point for all those who value liberal democracy and human rights, free and fair trade, the fight against climate change, poverty and violence. The G20 brings together 19 countries plus the EU. G20 members account for over 80% of the world’s gross domestic product (GDP) and they host almost two-thirds of the world’s population. 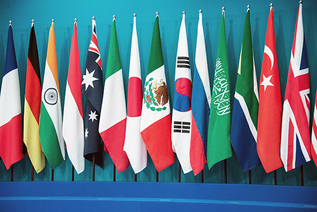 The G20 summit was established in 2008 amidst the global financial crisis to increase international economic cooperation. Since then, G20 members have been meeting annually to discuss a wide range of issues related to economic and financial cooperation. The European Union is a full member of the G20 alongside four of its member states: France, Germany, Italy and the United Kingdom. In addition, Spain is a permanent invitee of the G20 and the Netherlands is a partner country. Read this also while I was writing the Article this News is Flashed “US Diplomat Nikki Haley Blasts China, Russia For ‘Holding The Hand’ Of North Korean Leader” http://www.ndtv.com/world-news/nikki-haley-blasts-china-russia-for-holding-the-hand-of-north-korean-leader-1721146?pfrom=home-lateststories. The top U.S. diplomat to the United Nations blasted Russia and China on Wednesday for “holding the hand” of North Korean leader Kim Jong Un, as the Trump administration struggled to respond to Pyongyang’s latest ballistic-missile test.